The Australian Gold Lunar Rooster 1 oz Series 2 2013 is the sixth coin in The Perth Mint Australian Lunar Series. 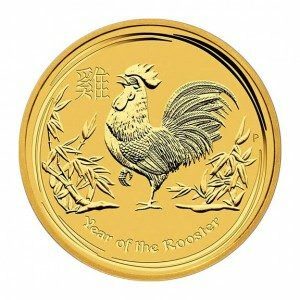 A completely redesigned coin from the 2005 Lunar Rooster the Australian Gold Lunar Rooster 1 oz Series 2 is slightly larger in diameter although the weight content remains the same. All the gold coins in the Lunar Series are .9999 fine gold, and each coin comes individually encapsulated in a plastic protective capsule. The Lunar Series silver coins are also .9999 fine. The Australian Gold Lunar Rooster 1 oz Series 2 will have a production cap of 30,000. According to Chinese Astrology, the Year of the Rooster person is a smart person. They think of clever schemes in a cold calculating manner. This Chinese zodiac animal sign represents people who are loners and use others to achieve their aims and goals. Another reason for the Australian Gold Lunar Rooster 1 oz Series 2 popularity is that they are limited production coins. In contrast, Gold Eagles, which are the world’s best-selling 22-karat gold coins, and Gold Maple Leafs, the world’s best-selling 24-karat gold coins, are unlimited production coins. Another feature that makes the Australian Gold Lunar Rooster 1 oz Series 2 popular is that The Perth Mint can produce back-dated coins until the production cap is met. This means that the earlier coins are still available and can be purchased near bullion coin prices, permitting collectors who learn of the series late to acquire the earlier coins at bullion coin prices. The policy of minting coins from earlier years is unique to The Perth Mint and for only the Lunar Series coins. By law, the Lunar Series coins have to display the image of Her Royal Majesty Queen Elizabeth II on the obverse. When the series started in 1996, the official likeness of the Queen was younger. In 1999, however, Buckingham Palace changed the official likeness to a mature Queen, which is carried forward into the Lunar II series. The change resulted in the first three years’ coins (1996, 1997, and 1998) having the image of the younger Queen Elizabeth and with the later coins having the mature image.